Application range::rymond mill is applied for the powder processing of mineral products in the industries of metallurgy,construction materials,chemical,and mining,etc.It can produce powder from more than 320 kinds of various non-flammable and non-explosive mineral materials with Mohs hardness below 8 and humidity at 6%,such as barite,calcite,limestone,feldspar,dolomite,glass,plaster,insulation materials,etc.The final product size can be adjusted from 80-480 Mesh,and the finest product can reach 600 Mesh. Rymond mill structure is composed of main mill,calssifier,pipeline,blower,and also can allocate with stone crusher,elevator,vibrating feeder,cabinet,etc. After the material is crushed to be the required size,the materials will be sent to storage hopper by elevator,then sent the material evenly to the space between the roller and ring through the vibrating feeder,to achieve the purpose of crushing through the roller rolling.. The grinded powder will goes into classifier along with the circulation wind of the blower and the standard fineness powder is guided to the cyclone collector and larger size stuff falls back to the grinder for regrinding,exhausted from the discharged tube,then can get finished product. 1. 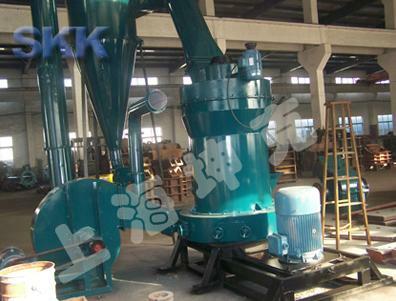 Compared with ball mill,this machine is with high effeciency,small floor space,small amount investment on time. 2.This mill is one set,one self-contained production system from bulk material to final powder. 3.For this machine, the conveying system adopt sealing gear box,stable trasmission,reliable operation. 4.The main wear parts is made of high-quality Mn steel to provide its wearing degree.